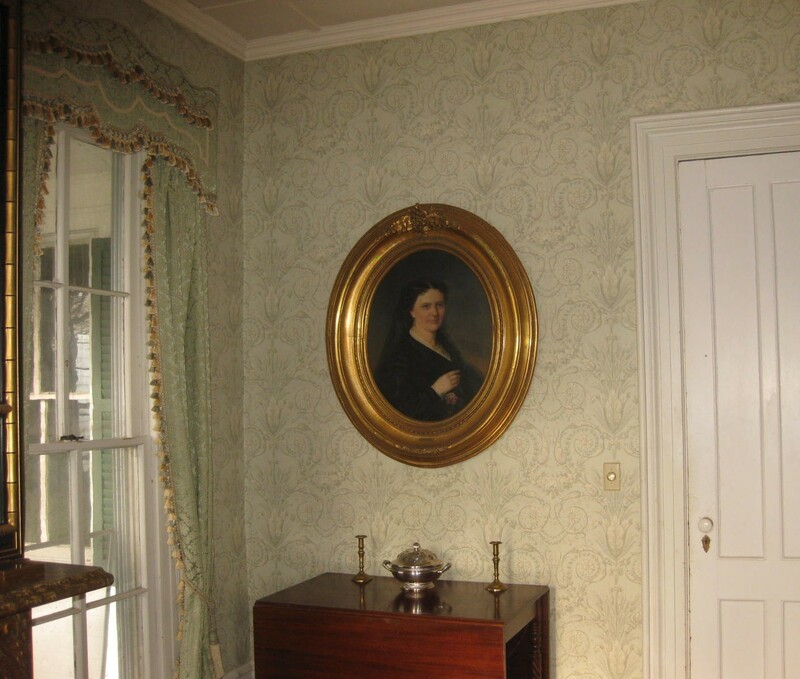 YOU’VE ALREADY SEEN the Music Room and the Entrance Hall in this 185-year-old house that I happen to call “home.” Shall we have a look at the parlor? You can access this room either through the pocket doors in the entrance hall, or from a single door opposite the staircase. 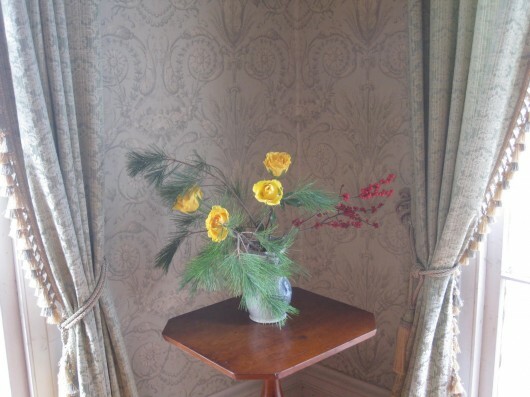 Like most of the other rooms in the house, the parlor is equipped to provide comfort in winter even when the power goes out (which is an all-too frequent occurrence in my neck o’ the woods). 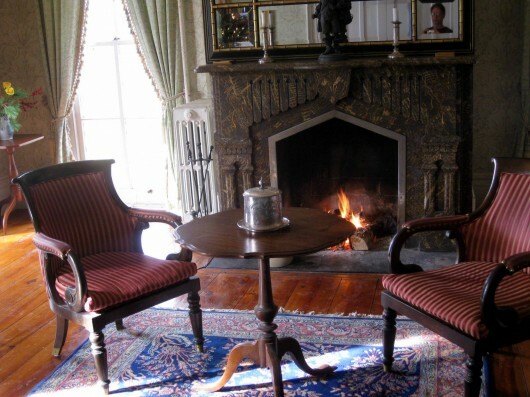 The most important feature in the parlor is the fireplace. This warms the room so efficiently — just as all Federal-era fireplaces did — that the “modern” radiator in the room is kept permanently turned off. I’ve even cooked entire dinners on the fireplace hearth. I think the ornately-carved, marble fire surround is mid-to-late Victorian. 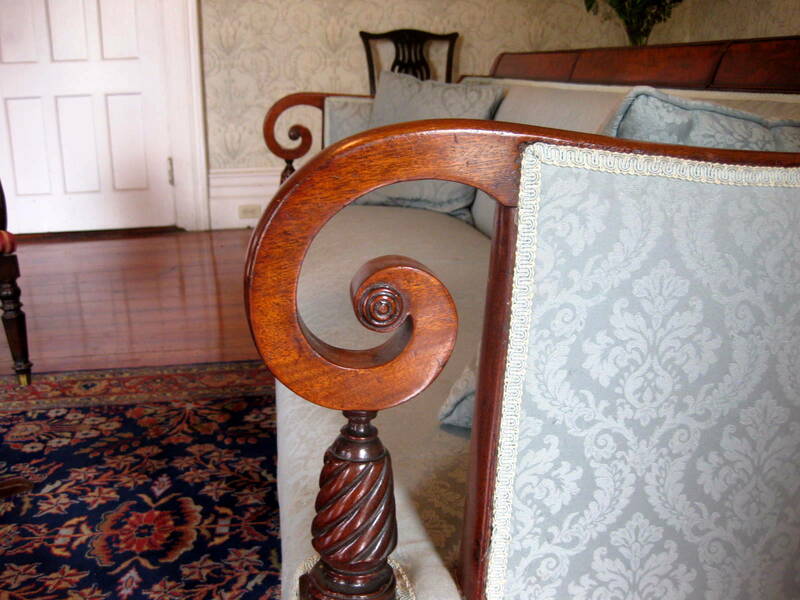 The original, Federal-era surround would have been carved from wood. The picture, taken in the 1890s, is quite warn. 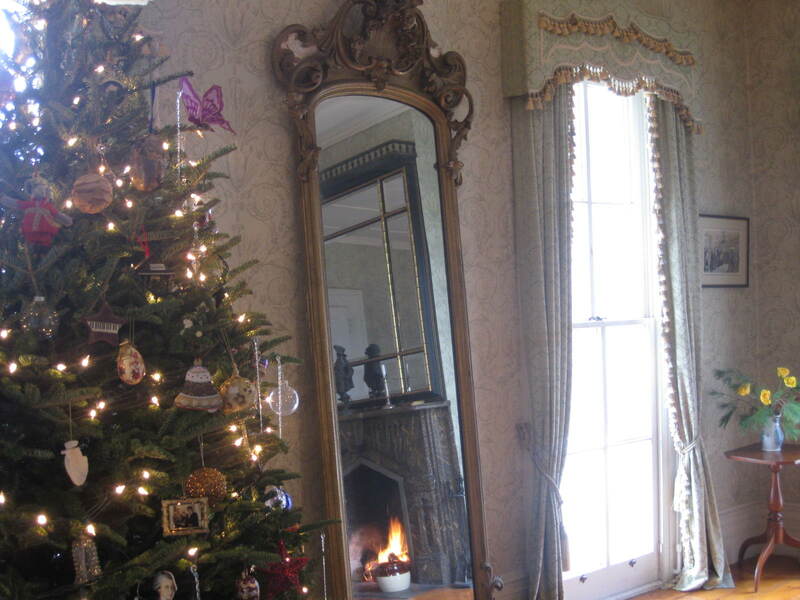 But you can clearly see the mirror existed over the mantel even then. And get a load of the large, gas chandelier! If only this had remained in the house. 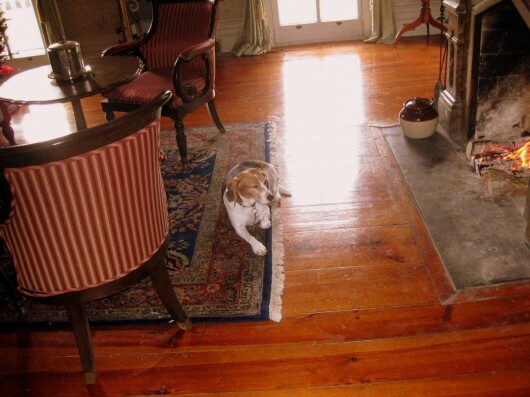 The wood floor is definitely original to the house, dating back to 1826. It is composed of wide planks of heart pine. How do I clean this 185-year-old wood? On my hands and knees. Now that’s a labor of love! The windows in the room start at the floor and end near the ceiling. They provide plentiful light — a necessity from the days when electric lighting was unheard of. I selected celery-and-cream paper for the walls in the room, and celery-and-gold window hangings. Close-up of a window-valance. True, the trim and tassels are on the elaborate side of things. But the room is a formal one, and it seemed to demand these frills. Furnishings in the room are a mixed bag of Federal and Victorian. 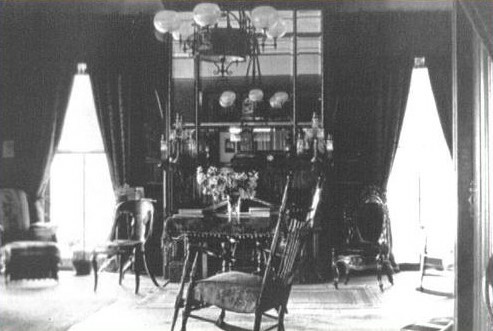 In one corner, two federal chairs (borrowed from the dining room) flank a marble-topped, late-Victorian table. 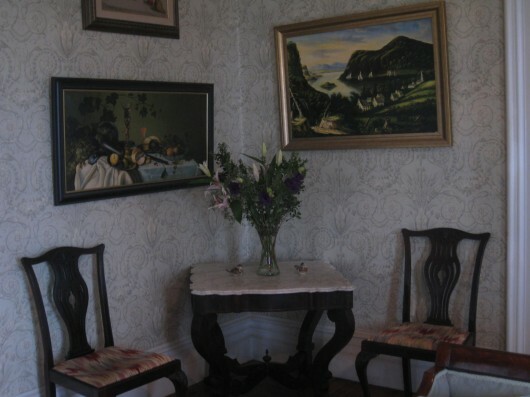 In another corner, a Federal gate-leg table stands beneath a Victorian portrait. I call the woman in the portrait “Prudence.” She is holding one of my favorite flowers — the peony. Prudence observes a good deal of life in this room. For it is where we gather with friends to enjoy cocktails. I’ll wager she enjoyed a good drink or two in her own day. My partner obtained the pair of federal tub-chairs, above, from an auction house in New Orleans. These are very comfortable for sitting, and they seem to me appropriate for the room. The sofa which faces the fireplace is quite old too. 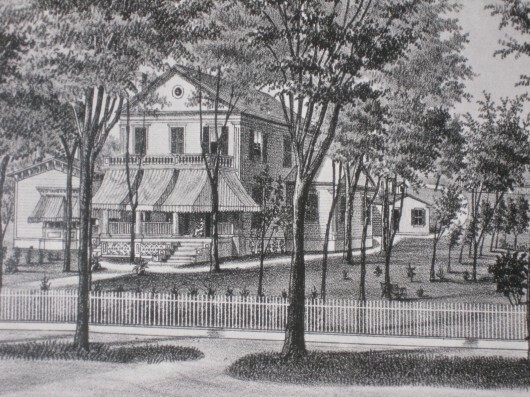 It was built in Boston around 1820. It entered our lives through an auction house in NYC. 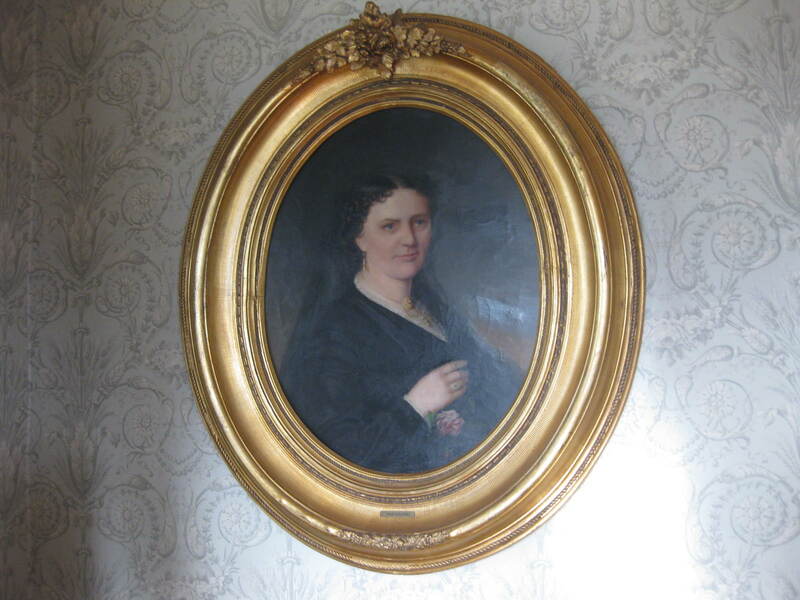 If you want good deals on antique furniture, auctions are definitely the way to go. While I was busy taking pictures, guess who wandered into the parlor? Why, it’s Lily the Beagle. She likes the warmth of an open fire as much as I do. If you’d like to see other rooms we’ve restored in this house, just let me know. As always, I love hearing from you. 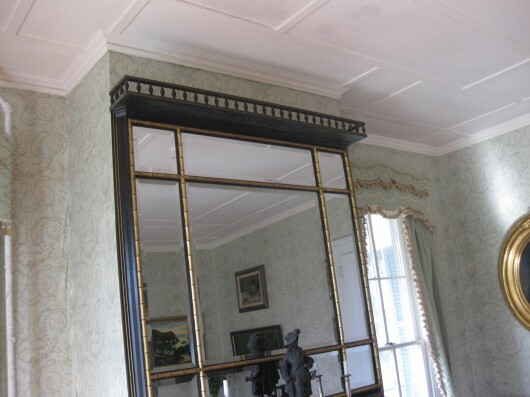 I love the mirror, furniture, wood, curtains, history! You are so fortunate that Janis shared family pictures of the house with you. The house is so lucky to have owners that have so lovingly and painstaking kept it so “period”. Looking at that old picture I wish I had the rocker, it looks lovely too. 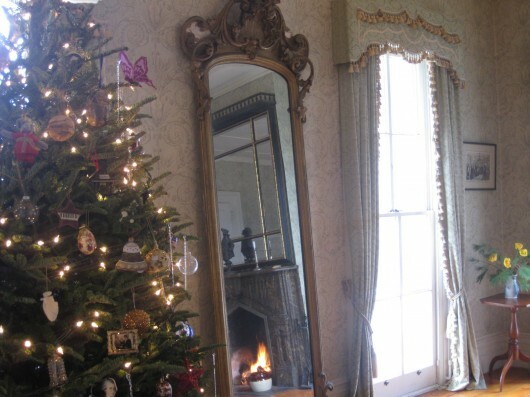 Yet another wonderful tour Kevin, Christmas tree included ~ thanks…hope you are enjoying the season. Keep the tour coming, please! Very enjoyable. I hope you continue to share as many rooms as you feel comfortable opening up to all of us drooling admirers. What a romantic setting–just lovely! Oh, I love everything in the room, it must be so cozy to sit there and watch the snow fall. Your wallpaper pick is fantastic. Have a great holiday. A beautifully adorned formal room, Kevin. Like the other rooms you have shown us, the fact that great care and love has gone into making this house the home that it is. You deserve much credit for bringing an old lady back to her glorious youth. 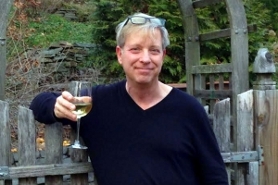 Kevin, I love the tour, I’m so glad you and your partner are taking such good care of this old house. Beautiful Kevin! Amazing mirror…and Love the flowers! I love looking at each and every room – please continue with the tour. I would love to see your kitchen and pantry. I’m with Erica–show us your kitchen and pantry! I will show you the kitchen. But trust me, it is not that interesting. In fact, I’ll bet every one of you have a nicer kitchen than I. The pantry, on the other hand, is a 19th-century gem. Beautiful! You should do one of those historic home tours. Just gorgeous! Thanks again so much, for the peek. Kevin, that fireplace is breathtaking! Imagine it being removed and attempted to be fit somewhere else? Outrageous! I do believe folks who preserve gorgeous architecture have a special place in heaven! Enjoy a blazing fire today…soooo chilly! 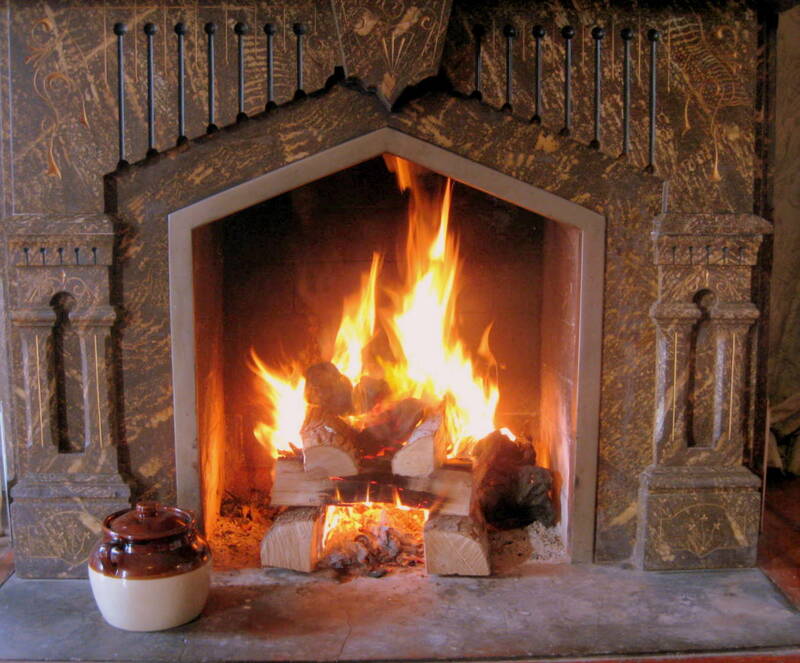 Cary – It’s definitely a day for a roaring fire. Only 22 degrees here! Very beautiful home! How many bedrooms and and are you going to provide more tours? I am intetested to know how long it takes you to clean up….always have dreamed of owning an old house. tiffany – nice to meet you. There are 7 bedrooms in all, but we use two of them for different purposes (one as a library, another as an office). As for cleaning, well, let’s just say this house could use the entire crew from Downton Abbey. Alas, it only me who does the cleaning. But I am lucky enough to have someone who comes in once each week to help with laundry. I love your parlor. The antiques are just amazing! I agree with the others, Let’s see the kitchen! Yes, please keep the photos coming…I’m so happy to have found your site. I enjoy to photo tour so much. You are a very talented designer. Also, I enjoy your other photos and tips too. Thank you for sharing. Wow, yet another amazing room. The fireplace may not be original, but with everything else in the room it works! I enjoy mixing some styles. Like the colonial upholstery on the couch. Thanks for the unclose pictures of the windows and cornices. So, what besides your fireplaces do you heat with? I love my fireplace but still . . . Which rooms will be next? Oh! How beautiful! Please, show us more rooms! I’m living my dream through you! Thanks for sharing! 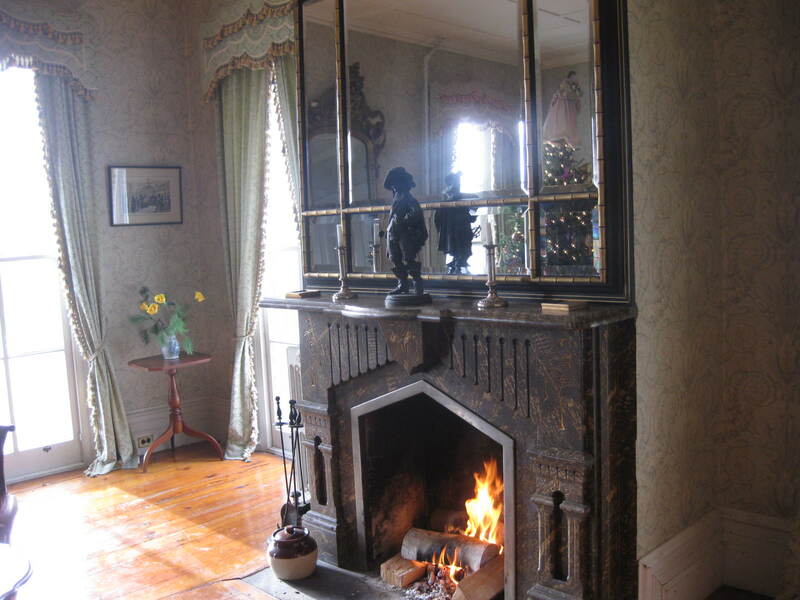 I am amazed that the fireplace keeps the parlor warm during the winter. Is there anything particular in construction that pushes the heat into the room rather that it all going up the chimney? By the way, a great house and what you have done is in great taste. Bravo! Hi Richard – The fireplaces in my house are extremely shallow. As I understand it, the shallow depth causes the firebox to heat up rapidly, thus producing radiant heat. This radiant heat quickly warms the objects in the room, and those objects in turn warm the air. Such fireplaces would not be efficient in a house with an open floor plan, of course. But because the rooms here all have walls doors, the heat can be contained. Truly spectacular, as are all your other restored rooms! I love seeing restoration projects that are truly done right, respecting the period of the house, etc. as you’ve done. Love your celery and cream scheme with a touch of burgundy. Gorgeous! 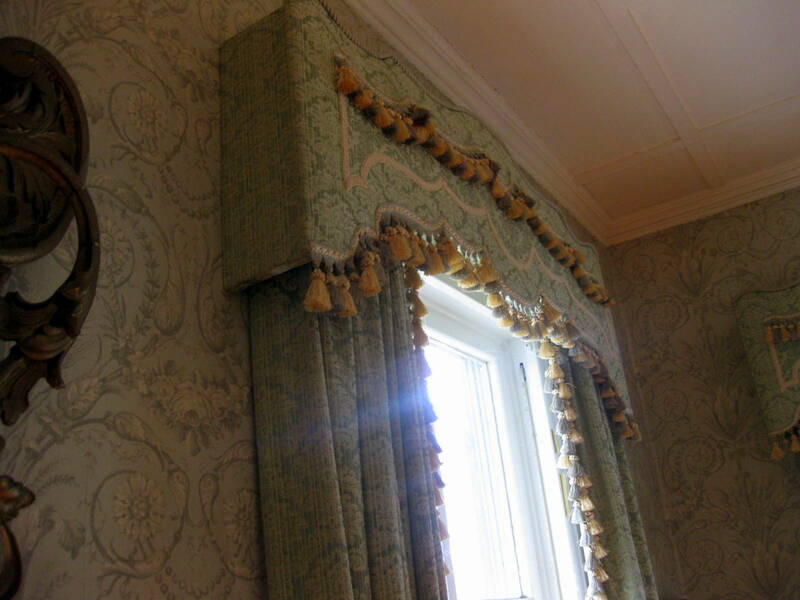 The celery wallpaper and draperies are lovely. You’ve done a very nice job with this room. And I am SO GLAD that you live with a dog! Dog people are almost always good folks. I have a black Standard Poodle named Tavi. He is a rescue, taken to a humane society at eight weeks with his three litter-mates by a breeder. Why on Earth? Don’t know, but my good fortune. A sweet boy who loves everyone. You may already know this, but your floor to near ceiling windows served another purpose in their early days. They promoted efficient air flow into the house to cool it off. By opening the top and bottom of the window the hot air rushed out of the top, and this pulled the cooler morning air in through the opening near the floor. It was very efficient for its day! Congratulations on your four page article in Country and Country featuring your beautiful home and garden.Love all the great recommendations and recipes on your website. I just wanted to tell you how stunningly beautiful your home and gardens are. I, too, live in a very old home, which can be overwhelming at times (though I chose it because I am a hopeless romantic, like you). Your posts have inspired me and I so hope to one day take a tour of your gorgeous gardens. Thank you for sharing your wonderful home with us! When do we see the bedrooms? I grew up in an 1875, 3 story white gingerbread Victorian house with black shutters…on the banks of the Charles river, west of Boston. The interior was never as grand as yours, but very nice. The house was taken in the 50’s, for a clover leaf as part of the Boston Toll Rd. Love your room! I recently upholstered a sofa same vintage as your Boston 1820 except the one I did was made in Vermont. Very stately piece! What does the kitchen look like? Did you restore the butler’s pantry and if so, what does it look like? Anything you are will to share would be wonderful! I, too, am a complete lover of vintage houses! What a truly splendid – splendid!! – home you live in! Warm, welcoming, functional, stylish, incredibly appealing – everything William Morris said beautiful art ought to be. I’m going to brag on someone here a moment, so forgive me – my maternal grandmother, Muriel deLacy (born 1904) was an architectural draftswoman and interior designer – well before most women even considered doing such things. She decorated homes for movie and Broadway stars, various dignitaries including Italian countesses, college presidents, a Greek shipping magnate or two, and such different places as several rooms in the National Cathedral, racetrack VIP lounges, yacht clubs… I did part of my growing up with her on Long Island (the other part on a timber farm in Va. with paternal grandparents!) and saw first-hand the magic she created for other people in their homes. You have the same eye for detail, colour, harmony of mixed periods and gracious flow of living spaces. PLEASE show us more! 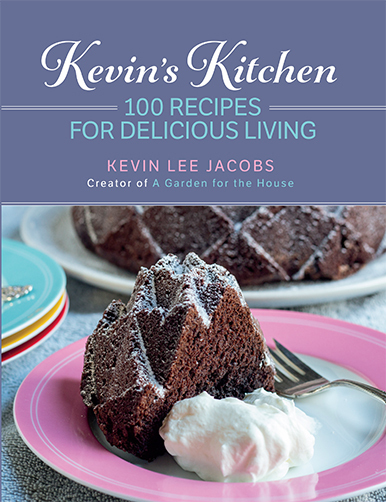 I’m a relatively new reader, and always look forward to your insights, instructions and recipes. Thank you for it all! What a cozy, welcoming home, Kevin. You are living my dream….I have always wished for an old house to live in but it hasn’t happened. I couldn’t agree with you more about the necessity of walls and doors inside homes. I think quietude and being able to shut a door to be alone are some of the more important features of the place we call home. Please do continue with the home tour, I can’t tell you how much I am enjoying my tour in your house! Thanks! We live in a 1901 Folk Victorian home on a farm. It is not large but I love it. We moved here 5 years ago and we are working slowly on the house. Kevin, please continue to share your home with us. I love to visit Victorian homes and yours is beautiful.